Sharon is our Front Desk Manager. 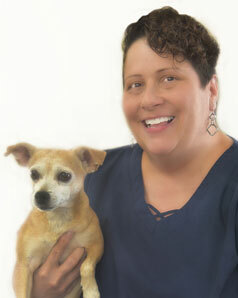 She has been a Veterinary Technician for over 25 years, and has been with Lakes Veterinary & Surgical Center since 2003. She combines her Business, Management and Vet Tech skills to keep things running smoothly at the front desk (no easy task!). She graduated from the Medical Institute of Minnesota and completed a three month internship at the Minnesota Zoo. She has also worked in emergency medicine. She is the proud parent of 3 cats, and a Chihuahua, named Carmella. In her spare time she enjoys watching movies, shopping and relaxing at home with her ‘furry kids’.